Today I’ll be repairing my toy! I got this remote-controlled car as a birthday present, and it’s very nice. On the last run, a suspension part came loose, causing oil to leak. No big deal! I’ll just take it apart and fill some fresh oil, then tighten all parts properly, just to be sure. It took an hour, and it was fun! It’s been, oh, 25 years since I last did this. That was a different car back then but still basically the same to a surprising degree. 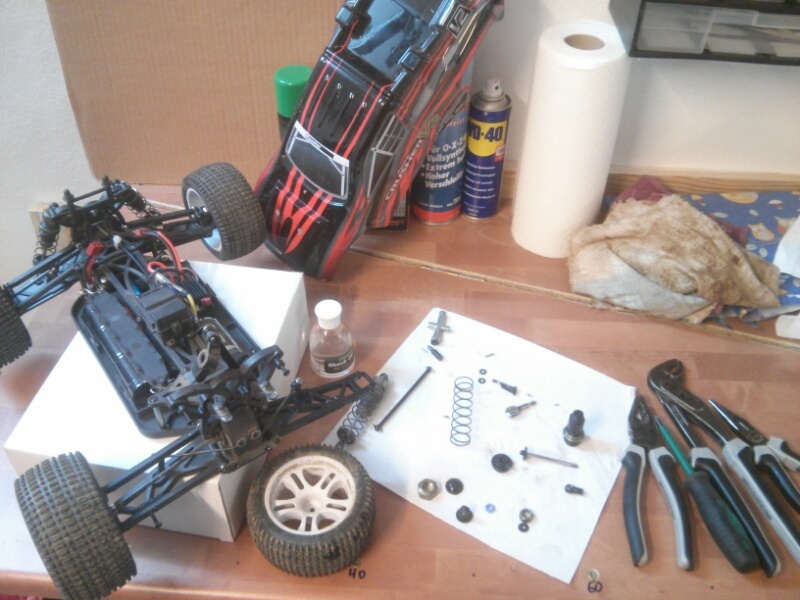 Battery pack, conventional electric motor, steering servo, and so on. There just aren’t that many ways to build a car. These days you can buy a lot of high-tech upgrades like carbon-fiber parts, Lithium batteries, brushless motors, and whatnot. But I am entirely content with a basic model – it’s more than enough to have some fun on the playground, and the kids love it. Last time I was there, nine or ten children were chasing it around, screaming with delight. Obviously I take care, and the safely of the kids comes first. If in doubt, I simply stop the car. Besides, it’s not that big and heavy, and it doesn’t have a loud and powerful combustion engine, so it’s perfectly legal. And very popular, even among adults. It is a toy. It is an adult toy – one that I can use in public! How fun – a remote control car! I can imagine you are quite popular on the playground with your kids and other kids!